The Sarasota County Croquet Club (SCCC) is the largest public croquet facility in North America. It was formed in 2000 on property owned by the City of Venice and maintained by the Sarasota County Parks and Recreation Department. The membership, now totaling over 200, draws players from all over the US, Canada and Europe. Tuesdays 12:30-3pm. Get reaquainted with croquet. It's a stepped up version of the game we played as children. It takes more skill, more strategy and it's definitely more fun. 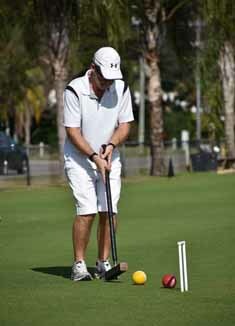 “Golf Croquet” is a very social and simple version of croquet that anyone can play and enjoy. At 2:30 PM, you are welcome to join the club, courtside, for wine and cheese and socialize with the members. Sunday Fun Day, from 2:45-5 PM for free instruction and to enjoy the easy, social game of golf croquet. Annual membership fees are $165 for individuals and $310 for couples which includes USCA dues. Monthly and weekly memberships are also available. Members can participate in free clinics, group and open play 7 days a week. The club holds several USCA sanctioned invitational tournaments during the year, which draw some of the top players from all over the country. Club Singles and Doubles Championships are held as well as several social tournaments. A monthly potluck dinner at venues or at a member's home are always well attended. Contact: sarasota.croquet.club@gmail.com for more information or call 941-900-4081. Come out on any Tuesday morning at 10:00 AM for a 1.5 hour class on the basics of croquet. If you like, follow it up with lunch at a local golf course club house, and stick around for an afternoon game of golf croquet, a simplified version of the game. Each year SCCC hosts several tournaments. Click this link to see our schedule of tournaments and sign up for some fun competition. As a very active club, we have monthly social events as well as a daily play and instruction schedule.